Last year we discussed garnets and emeralds that represent the month of January. This time around, I will discuss Onyx and Picture Jasper; stones that also celebrate this New Year month depending on which calendar you prefer to follow. For those who may be interested; listed below are other schools of thought and the corresponding gemstones for the month of January. Tibetan origin that date back over a thousand years. Date back to Indian Medicine and beliefs from 1500 BC. Planetary Stones: Ancient beliefs associated specific gemstones with the planets. It was thought that wearing the stone associated with the ruling planets at your time of birth would offer positive effects in your life. 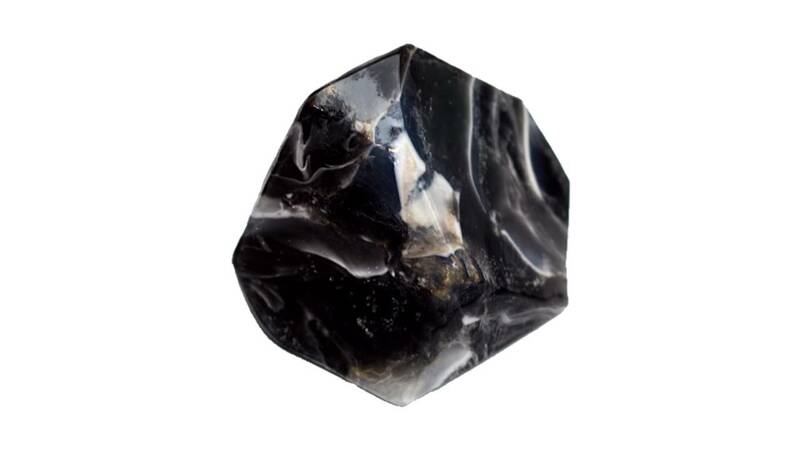 Black Onyx, historical acquired a somewhat sinister reputation and was considered bad luck. A manuscript from 1875 notes that in China, slaves and menial servants mined onyx. Nobody else would willingly touch or own this gem for fear of bad dreams and misfortune. Merchants couldn’t sell onyx in China, but they did bring it to the west and sold it to the unwary. This profitable trade suggests it wasn’t all that detrimental to business! Despite onyx’s negative associations, cultures all over the world have created beautiful jewelry pieces and other objects from this semi-precious gemstone.Tribes in Myanmar made onyx spirit statues for their homes and fed these spirits offerings of blood to sate them and keep them from feeding on their families. Onyx was also widely used in the past as bases and handles for gold items, as well as for stone inlay work. Onyx seals were very popular with the Romans, who carved the pattern of the seal in negative relief to give a raised point. Black Onyx with typical white banding. Onyx is formed by the deposition of silica in gas cavities in lava, which results in the distinctive bands or stripes in varied shades of black, red, orange, and brown, which often alternate with striking bands of white. Onyx was also traditionally used for carving cameo brooches, which are still popular today. 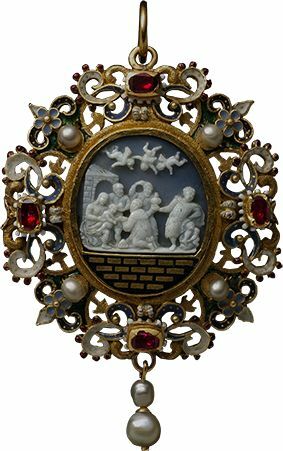 Ancient 16 century Onyx Cameo. 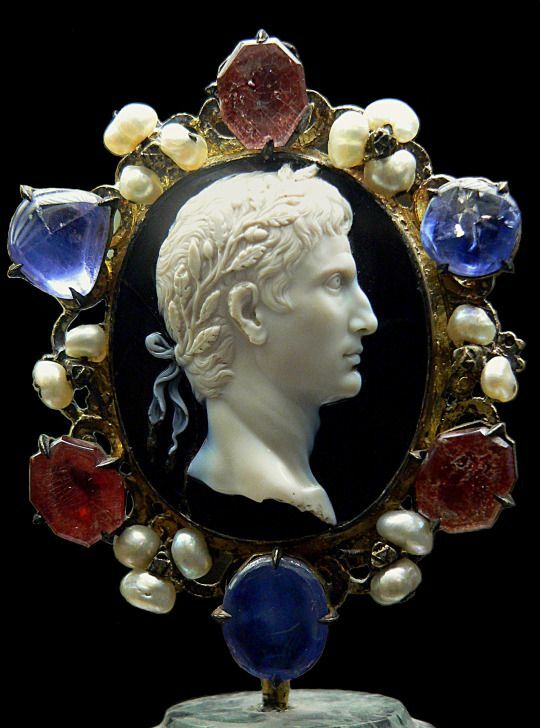 The Blacas Cameo showing Augustus. The best way to clean onyx is with a moist cloth. Do not use any sort of ultrasonic cleaners or ammonia as the stones may be porous and therefore might absorb chemicals, even soap, which can build up inside the stone, causing discolouration. Picture Jasper is characterized by it’s naturally formed landscape patterns and is believed to contain hidden messages from the past. It was revered in many cultures of the world for its deep connection to the Earth. In ancient and medieval times it was known as “the rain bringer,” a divining stone of the magical masters of wind and rain, called upon in secret to save harvests in periods of drought, or to save ships from violent storms. Picture Jasper was also used by the Native Americans for dowsing the land for water and by other cultures for divining the future. Picture Jasper is one of the stones I work with that I fell in love with instantly; the beautiful natural landscape patterns are a reminder of the some of the spectacular places I have been blessed to visit and live. Wishing you all the best in 2018!!! Agates and Emeralds celebrate the month of May…. Aventurine and Diamonds celebrate the month of April….